EKDM air flow range is from 1000m3/h to 400000m3/h. Available functional sections include fresh/return air mixing section, cooling section, heating section, primary/medium/high efficiency filter section, electric heating section, humidifying section, sound attenuation section, heat recovery section, secondary air-return section, fan section, air diffuser section etc. 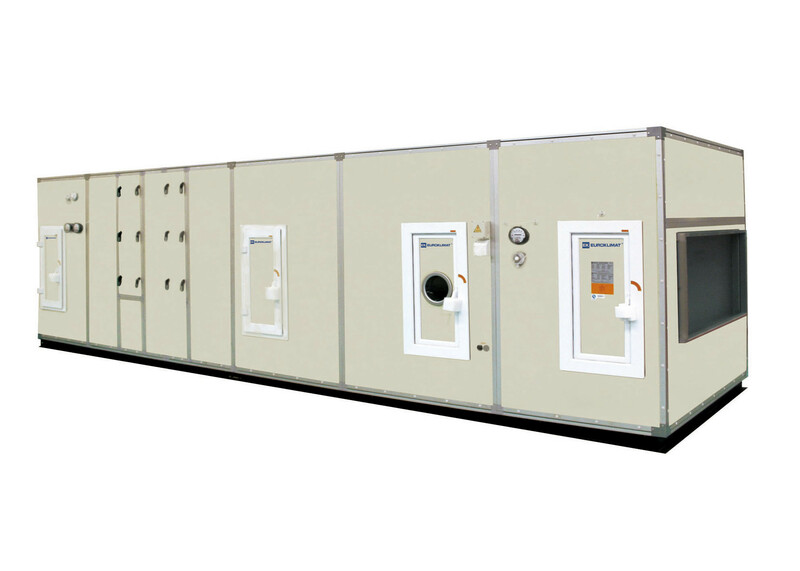 Different combinations can meet different air handling requirements. • The surface of the unit is made of quality color steel, which can resist corrosion, scratch and ultraviolet radiation. • Internal panels are made of steel plates galvanized with aluminum and zinc, with an assured service life of more than 15 years. All panels feature end-to-end joints and smooth surfaces, without any bur or corroded point. • The internal panels feature reinforced design, which is strong enough to support the largest air handling unit. • The unit panel has two thicknesses, namely 30mm and 50mm.Inside the panel, hermetically foamed polyurethane (no fluorine) with a density of 48kg/m3 is used as the heat- insulating material. The heat conductivity factor is less than 0.02W/m°C. • Each functional section of the unit is equipped with a steel trough base, thus ensuring it is well supported, easy to transport and assemble. The overall robustness of the unit meets the standard of CEN2. ■ This table only lists some typical models among many models for quick model selection. ■ Total fan pressures listed above are tested on standard fans with rated air flow. ■ External residual pressure = Total fan pressure - Internal resistance. For internal resistance of EKDM units.